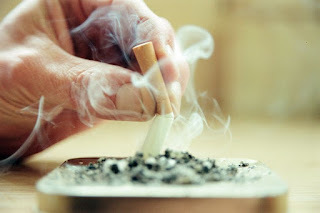 EndlessCoastalDecor: What Happens to your Body After You Quit Smoking? What Happens to your Body After You Quit Smoking? Probable the hardest New Years resolution to keep is the one that says "I'm going to quit smoking". But if you can keep that resolution the benefits are astounding! The body begins to heal itself just 20 minutes after the last cigarette. The heart rate and blood pressure begin to return to normal. After 8 hours this is a time of extreme craving as the nicotine is leaving the blood stream. After one day his is an extremely difficult time but hang in there . It does get easier. Take it from an ex-smoker. It will be worth it. After two or three days food will taste better and the sense of smell has improved already. If you get this far you are through the hardest part. After two weeks the gums and teeth show improvement. By one month most of the cravings should be mush less. If you get this far you are likely to be smoke free for good. The risk of heart attack has started to fall by two months and lung function is improved making physical activity much more tolerated. After three months walking long distances is much easier. Six months is the point when the air sacs in the lungs have regrown and healed some of the damage that smoking caused. After one year you are 50% less likely to have a heart attack or stroke. If you hit the five year mark your risk of developing diabetes are the same as a non-smoker. After five to ten years the risk of having a stroke is the same as a non-smoker. Ten years is the point when the chance of death from lung cancer is half that of a non-smoker. Mouth and pancreatic cancer is much reduced as well. The risk of heart disease is the same as a non-smoker. So, speaking from experience, I can tell you it is well worth it. Retired registered nurse operating a home decor website. Loves animals and is interested in marine life.